This lacy linen tunic is spiked with an unusual contrast of sparkly little "flowers" created with novelty yarn. This versatile piece can be easily dressed up or down for a variety of styles. 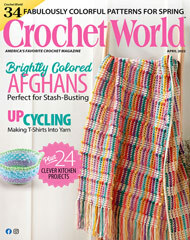 This e-pattern was originally published in the Summer 2012 issue of Crochet! magazine. Size: Includes Woman's S through 2XL. Made with fine (sport) weight yarn and sizes E/4/3.5mm and F/5/3.75mm hooks.